Looks like the Michigan Baseball team is finally back to the College World Series, after a three-decade absence from the annual event. Good job, Blue Boys, you made it, you won the league tourney to get the automatic bid. Way to go, hoo hah. 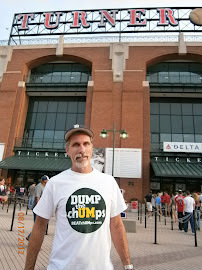 What the sports media want you to forget about is what happened to UM Baseball since the last time they made the CWS. Do you remember? at the end of the 1980s. How many times will the sports media mention this key historical fact while covering the UM Baseball team this week? Our "over-under" for such references is ZERO. The sports media are too deeply in love with Michigan to mention the truth about the UM past. Paying players in college sports is much worse then deflating footballs in pro sports. Doing so creates the ultimate "competitive advantage", so penalties for getting caught paying players go well beyond most other infractions. The reason UM hasn't made the CWS since the 1980s is because they were cheating at baseball. 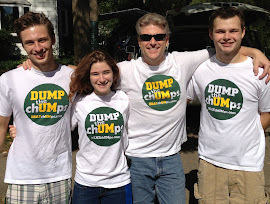 Coach Bud Middaugh created fake jobs to funnel cash to players, like walking around Michigan Stadium on football game days wearing a bib and holding up gameday programs. Players "found" $500 checks in their lockers on a periodic basis. 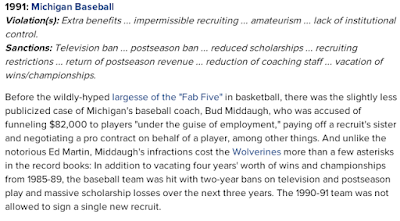 Middaugh denied the allegations, but they were so obvious that Michigan Athletic Director Glenn Shembechler fired him almost immediately. The banners came down, the trophies were returned, the record-books were changed, the scholarships were taken away. 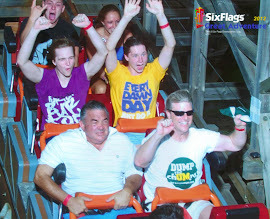 And the program sunk to the lowest level, after riding high for decades. much the same as Michigan Basketball. The screen shot below was taken from a CBS Sports web site. 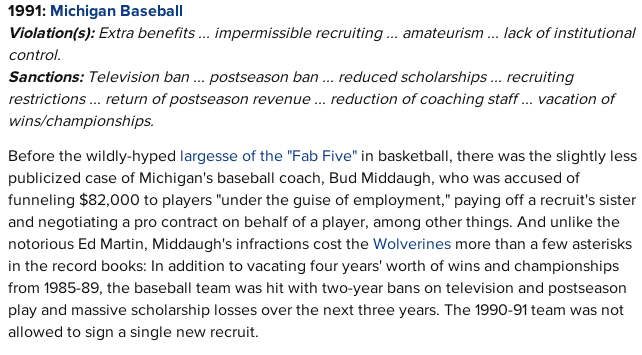 Links to other reference articles on the history of University of Michigan Baseball are listed below. "Baseball at the University of Michigan"
Michigan State Football is back in the news again, not for recruiting or winning games, but for playing a big role in de-segregating major college sports. Many Spartans have known these stories for many years, so it's good to see the information gain a wider audience. And what of the Great Michigan in this regard? What role might their "leaders and best" have played in forging an even playing field of racial equality in America? led by the great racist, Fielding Yost. Michigan’s head coach from 1901 to 1926, Fielding H. Yost, had unequaled ambition and ego. But he also had a blind spot: he was a racist. Trouble arose in 1934, when Yost invited Georgia Tech to play in Ann Arbor. At that time Southern schools did not allow blacks to play on their teams, or even play teams with black players. So, when a Northern team played a Southern team, it was customary for the Northern team to bench its black players, and the Southern team to bench white players of equal skill. When Yost made it clear he was going to follow the custom, he was stunned by the national backlash. Michigan’s president, Alexander Ruthven, given an opportunity to stand up and be counted, chose instead to duck. UM left the door open for MSU to open doors for minority players, and that's just what happened in Spartan Country. of "leaders", and they did it in the "best" ways possible. Michigan was just another school. The Michigan Softball program has made it to the World Series again, bully for them. Another great season by another great team. Congrats. a 1979 graduate of Michigan State University. Just another fact to throw into the mix. Hutchins played on the 1976 MSU team that won the national championship, but her older teammate (Gloria Becksford) was hired to be the Spartan Coach before Hutchins graduated. Hutchins left for Indiana, then came to UM, and the rest is her story. There's one blue team that was built on a green foundation. "THE JIM HARBAUGH SHOW": PLAYING DAILY IN ANN ARBOR, ADMISSION BY "FREE PASS"
The last penalty expired only about two years ago. That was six years into the UM coaching career of John Beilein. It still hasn't been "that long" since the last effects of the Michigan Basketball corruption scandal began to diminish. Those who ignore history, as they say, may be doomed to repeat it. Nothing like a little factual information to set the record straight. In the case of Tom Brady, the facts show that he cheated to win. So, he's a "winner", but he's also a "cheater". 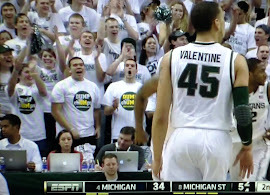 Typical Michigan Man, eh? How many times in recent years have we heard about the greatness of Brady, brought up by rabid Walverines, always to shine the great luster of UM, usually to counter the success of any quarterback from MSU. What now for the chUMps who have used Tom Brady for years as their ace-in-the-hole for any football argument? Brady now goes the way of other Wolverine Heros like Taylor Lewan, Desmond Howard, Brady Hoke, Roy Tarpley, Chris Webber, Mitch McGary, Bud Middaugh, Les Miles, Gary Moeller, and so many others. All of the aforementioned at one time were considered great, almost deities in their own realm, only to fall from grace and be exposed as a liar, a cheater, a kook, incompetent, a rage-freak, a drug-addict, or some combination of these fine qualities all rolled into one blue-and-yellow package. In other words, they were all objects of worship for Michigan fans until they spun, crashed, and burned. Tom Brady is the latest in an incredibly long line of Wolverine wipeouts. We've seen this story so many times before. Moeller, Webber, Tarpley, Hoke, now Tom Brady. They call themselves "Leaders and Best". Seems like we keep hearing about "fake-out" attempts by the University of Michigan. They faked the attendance numbers for their football games, they faked an exhibition basketball game into a regular-season game (Hillsdale), they faked a "Senior Night" for a player who was not a senior and whom they may still "re-sign" for his second "senior season" (Max Bielfeldt), and they faked a college basketball career for a player whom they dropped like a hot potato as soon as better players appeared on the horizon (Austin Hatch). We've been reporting on the faked-out nature of their so-called "All-Time Wins" record for college football. UM claims 915 "victories" and the top-spot amongst Football Bowl Subdivision schools, yet we've shown how dozens of their claimed wins were against pick-up squads of high-school age kids. egregious claim of them all. to win six games that year. They even admitted to cheating. The non-college-student who caught most of the attention was James "Joy" Miller, arguably the best player on the UM team in 1909. Turns out he barely attended any classes, and he was never actually enrolled as a college student at Michigan. In other words, he was a professional player. the UM-loving mainstream sports media. "The facts of the case are that Mr. Miller returned to college late this fall, registered in the Engineering Department but neglected to enroll in his classes, although he did attend some of them." "On Christmas Eve 1909 the New York Times broke the news to the world with a headline that howled “FOOTBALL SCANDAL IN MICHIGAN TEAM”. Miller’s colleagues in the School of Engineering recommended that he be kicked out of school. After ignoring several requests to return to campus to face the charges, Miller was officially expelled on January 14, 1910." So there goes another six (6) "football wins" swirling down the drain-pipes of history. And along with it, the mythology that Michigan never cheats at football. Looking over the historical record, it's not so hard to understand the roles played more recently by players like Taylor Lewan, Brendan Gibbons, and others. Combined with our other articles on this topic (links below), that makes 27 undeniably bogus football wins for UM, leaving them a mere eight (8) games ahead of Notre Dame on the all-time list. Can we find more fake victories? Yes we can, stay tuned to this web site! It was a grand time in Michigan football history. Glenn Shembechler had moved on from coaching at UM to firing Ernie Harwell, and the heir to the Wolverine Throne was Gary Moeller. The baton was passed and all was good in Ann Arbor. Moeller had served his head-coach-in-training duties at Illinois, where he basically stunk up the joint. But that didn't matter, as he was coronated the King of Michigan Football after three dismal years with the Illini. Must be because he played football at Ohio State. And off he went, following his destiny into the history books, until...until......until THIS DATE IN HISTORY (1995) when Moeller lit up the sports media with a drunken rage unmatched in college football history. It was 20 years ago today that Gary Moeller burned his career into the ground by drinking heavily in public, berating and possibly hitting his wife in a restaurant, and fighting back against the UM-loving police who were very willing to get the incident brushed under the carpet before anybody heard what happened. It was long after Moeller was "resigned" that stories began to circulate regarding what made him go crazy on that fateful night. According to the rumor-mill, Moeller's wife chose that time and place to inform him of her adulterous affair with one of her husband's assistants, the younger and presumably more virile Les Miles. We can doubt that story, but Les Miles never made it back to Ann Arbor through three coaching changes at UM, so maybe the story holds water. 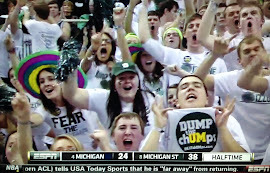 What a great social portrait of Michigan Football culture, eh? Quite a "family atmosphere", right? The assistant coach sneaking around to have an affair with the wife of the head coach, sparking an historic public meltdown by the highly overrated cuckold of Ann Arbor*. a man who turned himself into a clown for all to see. *Have you ever seen those t-shirts that say "Ann Arbor is a whore"? Maybe they refer to Mrs. Ann Moeller. 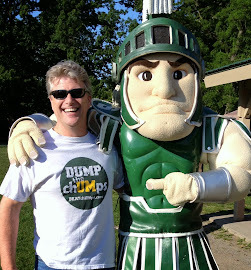 Funny that Michigan folks want to claim that Michigan State folks have an "inferiority complex", when we know that the "UM Brand" relies on people like Augie Janke to keep its cash machine rolling. Notice how this chUMp proudly proclaims that he was not "the caliber" for Michigan, then compares a community college to a Big Ten member institution. 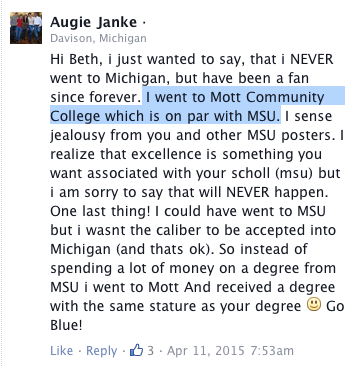 Perhaps Augie Janke will provide us with some inspirational quotes from the football coach at Mott Community College.